Does motorcycle safety gear really reduce injury and death from a crash? Motorcyclists have a much greater risk of being seriously injured or killed when they are involved in accidents. According to the Insurance Information Institute, 4,976 motorcyclists were killed in 2015, which was an increase of 8.3 percent over the number of people who were killed in motorcycle accidents in 2014. Another 88,000 people were injured in motorcycle accidents in 2015. Because motorcycle operators and passengers are largely unprotected from the environment around them, they are likelier to suffer a number of different potentially catastrophic injuries in accidents. Safety gear helps to reduce the risk of injuries and their severity. The Centers for Disease Control and Prevention reviewed data from hospitals for people who had been treated for injuries that they suffered in motorcycle accidents from 2001 to 2008. The CDC found that 30 percent of the injured victims suffered injuries to their legs and feet, making those injuries the most common type of injury suffered by motorcycle accident victims. Twenty-two percent of the people suffered injuries to their heads and necks. Finally, the next most common type of injuries occurred to the trunk area, which was followed by the arms and hands and lastly, to the hip and pelvis. Safety gear is meant to reduce the severity of injuries that people suffer, and it may help to prevent some injuries. The Association For The Advancement Of Automotive Medicine reviewed data from Maryland motorcycle injuries that occurred from 1998 to 2002. The researchers found that the most common cause of fatalities in motorcycle accidents was thoracic injuries followed closely by head injuries. The third most common cause of motorcycle accident deaths was an injury to the abdominal region. Safety gear is available to protect every part of your body from your head to your feet. Motorcycle helmets are essential for riders because they contain layers of styrofoam in precise densities to help protect their heads from the forces involved in accidents. Gloves are also available and help to protect the hands if you fall from your bike. Motorcycle jackets, pants and suits are designed to protect your trunk and legs from being injured in accidents. Available to wear under the pants, jackets and suits, body armor adds an additional layer of protection. Finally, motorcycle boots are designed to protect your ankles and feet if you are involved in a motorcycle accident. Safety gear may help to prevent or reduce the severity of motorcycle accident injuries. While better gear is expensive, the cost outlay is well worth the superior protection it offers. The minimum standard in the U.S. for helmets is DOT-certified, but it’s a good idea to opt for the higher protections afforded by the European standard, or ECE 22.05. Helmets that meet the ECE 22.05 standard are designed to withstand a major impact followed by multiple smaller impacts. By contrast, DOT-standard helmets are only designed to withstand a single major impact, meaning that you can suffer injuries from smaller impacts that happen after the initial one. Good gloves should protect your hands from abrasions and impacts. They should have retention straps that keep them secured tightly around your wrists. 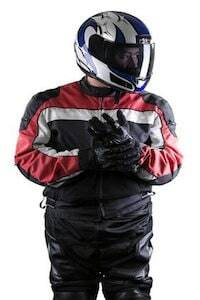 You’ll also want to find motorcycle gloves that have armor for both the backs of your hands as well as your palms, and your gloves should be waterproof and insulated to protect your hands from wind and rain. Good-quality motorcycle jackets, pants and suits are essential to protect your body from severe abrasions and fractures. You should look for items that are made out of thicker materials and high-quality leather. Materials such as Cordura 1000D and Gore-Tex can protect your body through several crashes while also keeping you warm and dry in the rain. You should also opt for body armor that covers as much of your body as possible for the best protection, and the body armor should be CE-rated. Body armor can protect your lungs, heart, rib cage, hips and pelvis, substantially reducing the risk of sustaining serious injuries to your upper and lower trunk. It can also help to protect your legs, elbows and shoulders, and it should not be overlooked. Motorcycle boots help to protect your feet and ankles from crushing injuries, sprains and fractures. Good motorcycle boots should offer good grip and should cover your ankles while offering good support. While an investment in quality safety gear may seem expensive, it is important for you to protect yourself as best as you can when you are operating a motorcycle. Safety gear can help to reduce the risk of suffering serious injuries or death, allowing you to enjoy your motorcycle in a safer way. If you have been injured in a collision that was caused by another motorist, you might want to consult with an experienced personal injury attorney to learn about your potential recovery rights. What Body Parts Will You Most Likely Injure in a Motorcycle Crash?